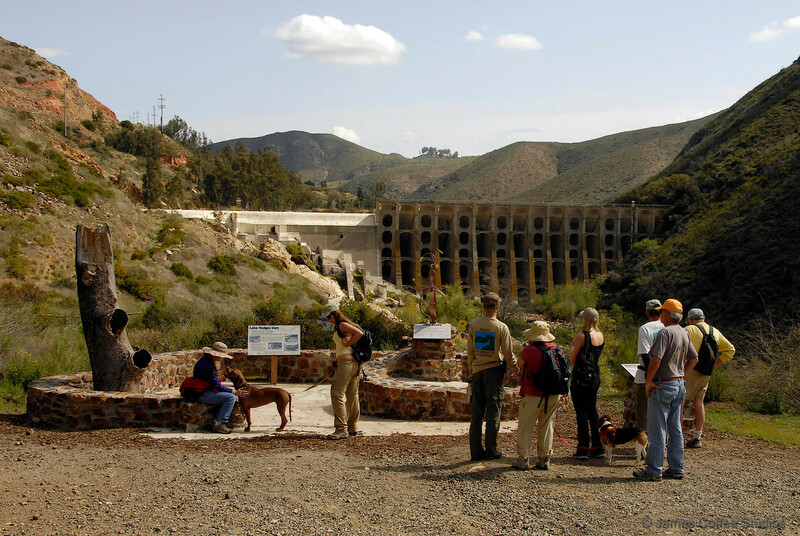 The Rattlesnake Viewpoint is an area for trail users to sit and enjoy the views of the Lake Hodges Dam and the San Dieguito River below in the gorge. We call it the “Rattlesnake” Viewpoint not because you’ll be viewing rattlesnakes, but because it is made from native rock in the shape of a rattlesnake. 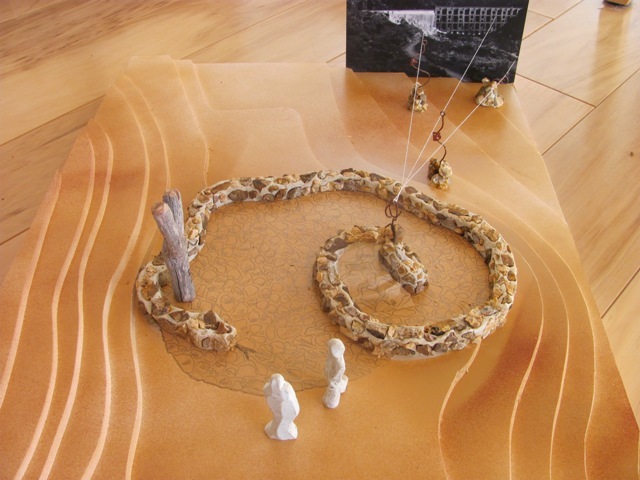 An interpretive panel explains the place of rattlesnakes in our ecosystem. Another feature is a burned and dead tree, which provides information about the impacts of wildfires. 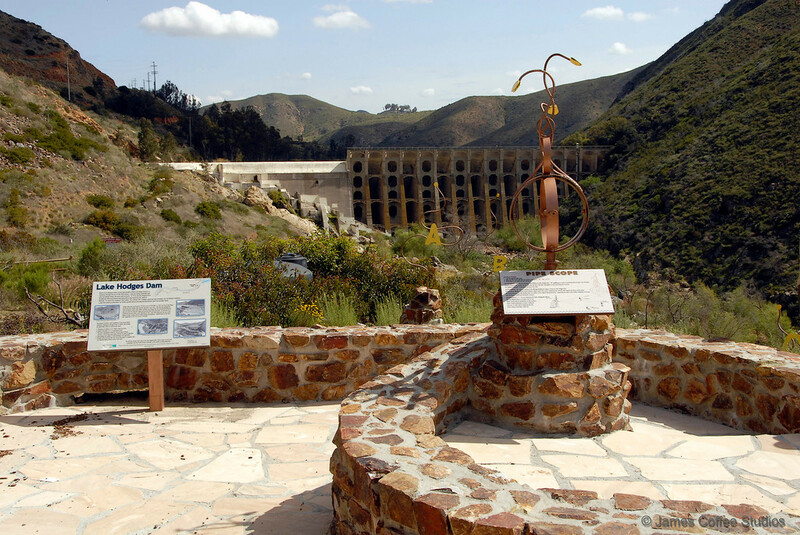 In the center of the viewpoint sculpture (at the apex of the snake’s tail) is a pipe scope through which one can look and line up with another feature, marked A, B or C, which point out the spillway, the bulwarks of the dam, and the river below. In San Diego County, just south of Del Dios Highway, downstream of Lake Hodges Dam, and along the Del Dios Gorge segment of the Coast to Crest Trail. There are two ways to access the viewpoint. If driving east on Del Dios Highway make a right just after Calle Ambiente (at the Lemon Twist Fruit Stand) and head down the driveway to the Santa Fe Valley Staging Area; on foot, bike, or horseback head east on the Coast to Crest Trail for approximately 2 miles. If driving west on Del Dios Highway make a left on Rancho Drive and park at the trail access at the bottom of the hill; on foot, bike, or horseback head west on the Coast to Crest Trail towards the dam for approximately 2 miles. Click here for more information or maps. River Parkway (Proposition 84) grant funds from the State Resources Agency. The grant also funded a major eucalyptus removal (and replanting with native sycamores and cottonwoods) in Del Dios Gorge and trail improvements, including several covered picnic tables and benches.